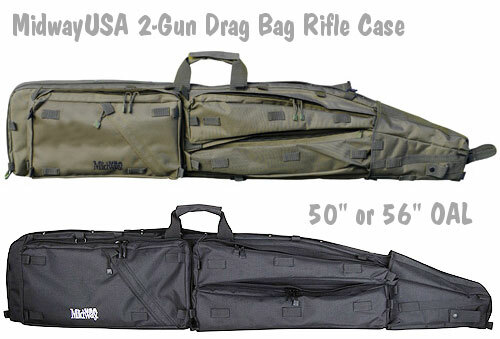 MidwayUSA has released new versions of its tactical gun case/drag bag that has earned very high marks from purchasers. This product is plenty wide, with a padded internal divider, so it really can handle two rifles. One purchaser confirms: “[This drag bag] holds my custom 300 Rem mag and my AR-15 with plenty of room.” MidwayUSA’s Sniper Drag Bag Scoped Rifle Gun Case comes in two lengths — either 50″ or 56″ overall. MidwayUSA says the internal length is 4″ shorter than the overall length, but that’s a little conservative. The 50″ length will handle most rifles with up to 25″ barrels, while the longer length should handle 30″-barreled rifles. We’re pleased MidwayUSA offers two lengths. One of the problems with many “tactical” gun cases is that they are simply too short for modern target rifles, particularly F-TR rigs. And many tactical competitors are running fairly long tubes these days. MidwayUSA’s drag bags are made from tough, Cordura-style PVC-coated nylon, with reinforced stitching, heavy-duty zippers and closed cell foam padding in all pockets. These are big bags, with three large external pockets and one internal pocket. Notably, the full-length padded divider wall allows for secure two-gun storage, although this becomes a very heavy package with two scoped rifles inside. To assist with field carry, the MidwayUSA Drag Bag features backpack-style shoulder straps. Here’s the good news — now through the end of July, 2011, the shorter, 50″ Drag Bag is only $64.99 in either black or OD. You can save $35 off the regular $99.99 price. If you’re a tactical shooter and your rifle can fit in the shorter 50″ bag, jump on this deal. We doubt you can easily find another gun case with so many features for just $64.99. The 56″ Drag Bag costs $129.99, in either black or olive drab. Share the post "MidwayUSA Tactical Dual-Gun Drag Bag on Sale for $64.99"
Do you guys post to UK?